An 80-year-old woman presents after developing painful eroded blisters on her hands (Figure 1). A culture of a skin swab has been performed and returned negative results for bacterial and fungal species. At presentation the patient is afebrile; she has recently been well, but she has been diagnosed previously with acute myelocytic leukaemia. Staphylococcal infection. Acute infection should be considered in this patient, particularly if she is taking immunosuppressive medications. An infection caused by Staphylococcus aureus can progress rapidly in an immunosuppressed host, and a skin swab would usually be positive for the organism. Lesions are characterised by crusting, bullae and abscess formation; localised swelling, redness and tenderness can also be evident. Other features include generalised malaise, fever and lymphadenopathy. Atypical mycobacterial infection. The deep ulcerations visible in Figure 1 are more suggestive of an atypical organism such as Mycobacterium marinum or Mycobacterium ulcerans than a staphylococcal infection. Contracted from contaminated water (such as in fish tanks), M. marinum causes ulcerating papules and large nodules. M. ulcerans, which may occur after trauma or exposure to vegetation and bushland, usually causes a single itchy, painless nodule that progresses rapidly. Mycobacteria usually return positive tissue culture and PCR results and have characteristic features on histological examination of biopsied material. Pyoderma gangrenosum. This uncommon neutrophilic dermatosis typically affects people aged 40 to 60 years and is characterised by inflammatory and ulcerative lesions (Figure 2). Its pathogenesis is largely unclear and it is a diagnosis of exclusion. Pyoderma gangrenosum is associated with systemic diseases such as inflammatory bowel disease, rheumatoid arthritis, haematological malignancies and systemic lupus erythematosus. Patients report severe pain at the site of the lesion, which is often disproportionate to its appearance.1 At onset, the lesions are small inflammatory pustules – these expand rapidly, with erosion and ulceration becoming visible from the centre outwards. The ulcers tend to have a purulent and necrotic base, with well-defined, irregular borders that are undermined (Figure 2). It is not the most likely diagnosis for the patient described above, whose lesions appear more nodular than those seen in this condition and which do not have undermined borders. Cutaneous malignant infiltrate. Any internal malignancy can result in a cutaneous lesion, either as a metastasis or as a paraneoplastic phenomenon such as Sweet’s syndrome, paraneoplastic pemphigus and dermatomyositis. Sweet’s syndrome is characterised by fever and lesions which are similar to those seen in this case, and around 10% of affected patients have an underlying malignancy, most commonly leukaemia. The lesions of paraneoplastic pemphigus are characterised by tense bullae and blistering (as opposed to nodular ulceration) as well as mucocutaneous lesions, but isolated lesions on the hand that are deeply ulcerated would be highly unusual. Dermatomyositis, which is associated with solid organ tumours, often presents with scaly, erythematous papules and plaques on the dorsum of the hand, but the lesions do not ulcerate. Neutrophilic dermatosis of the hands. This is the correct diagnosis. It is characterised by painful nodules and plaques that develop pustules and can ulcerate, and which are generally located on the dorsum of the hands (rarely on the palm). Multiple lesions are a feature of this condition,2 which is slightly more common in women than men and is usually associated with haematological and lymphoproliferative disorders and some inflammatory conditions, such as inflammatory bowel disease and arthritis. 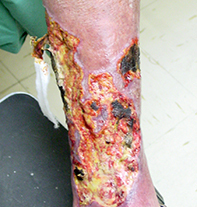 There may be a history of pathergy (minor trauma leading to a significant wound on the skin) and preceding fever, but it is more common for patients to be asymptomatic. Patients with this condition often undergo a trial of antibiotic therapy, which is not effective. It is often thought that neutrophilic dermatosis of the hands has similar pathogenesis and appearance to Sweet’s syndrome, but in the latter condition the lesions are not limited to the hands. Neutrophilic dermatosis of the hands is largely a clinical diagnosis. Cultures of skin swabs return negative results for bacteria and fungi, but it is important to take a skin swab or biopsy to exclude opportunistic infection, including by atypical organisms. A full blood count should be conducted to look for evidence of neutrophilia that may indicate an infective process; abnormal counts of white cells, red cells and platelets may be suggestive of an underlying haematological malignancy. A raised C-reactive protein (CRP) and erythrocyte sedimentation rate (ESR) may be evidence of an inflammatory process. Liver function tests, an electrolytes screen and renal function tests should be performed prior to commencing systemic therapies. Some cases of neutrophilic dermatosis of the hands heal spontaneously, and in other cases a potent topical corticosteroid may be sufficient therapy. The condition usually responds rapidly to oral corticosteroids. However, even treated lesions can recur, and it is important that treatment be tapered slowly to reduce the likelihood of this. Patients should be monitored carefully even after ceasing treatment, and it should be recommenced if there are any signs of recurrence. 1. Ruocco E, Sangiuliano S, Gravina AG, Miranda A, Nicoletti G. Pyoderma gangrenosum: an updated review. J Eur Acad Dermatol Venereol 2009; 23: 1008-1017. 2. Galaria NA, Junkins-Hopkins JM, Kligman D, James WD. Neutrophilic dermatosis of the dorsal hands: pustular vasculitis revisited. J Am Acad Dermatol 2000; 43: 870-874. 3. Cohen PR. Skin lesions of Sweet syndrome and its dorsal hand variant contain vasculitis: an oxymoron or an epiphenomenon? Arch Dermatol 2002; 138: 400-403. 4. Malone JC, Slone SP, Wills-Frank LA, et al. Vascular inflammation (vasculitis) in sweet syndrome: a clinicopathologic study of 28 biopsy specimens from 21 patients. Arch Dermatol 2002; 138: 345-349.